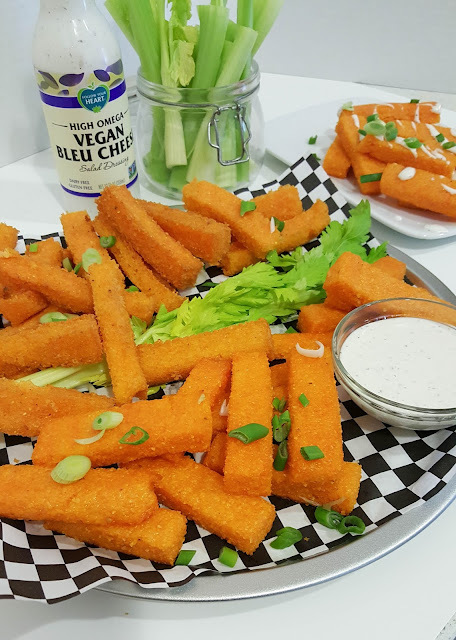 These Polenta Fries can be baked or fried, and I actually think they taste better baked. I know, who am I? 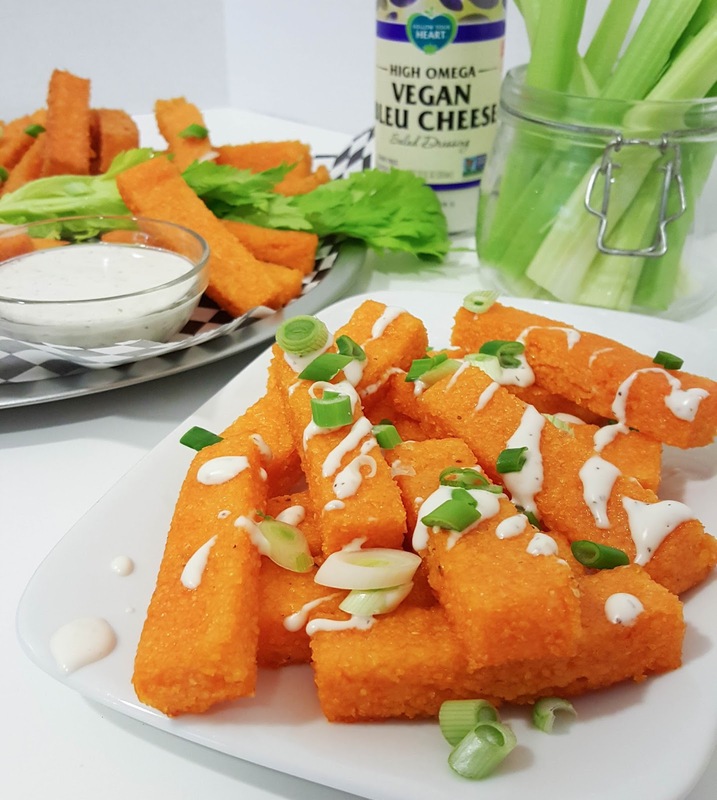 Either way you decide to make them, make sure you serve them up with celery sticks and some Follow Your Heart Vegan Bleu Cheese Dressing to dip 'em in. Bring water to a boil in a large. Stir in salt. Slowly whisk in polenta. Reduce heat to medium low and continue to stir until polenta is thick and creamy (kinda like Cream of Wheat) which will take about 10 minutes. Remove from heat and stir in butter and hot sauce until fully melted and mixed in. Line a rimmed baking sheet with parchment. 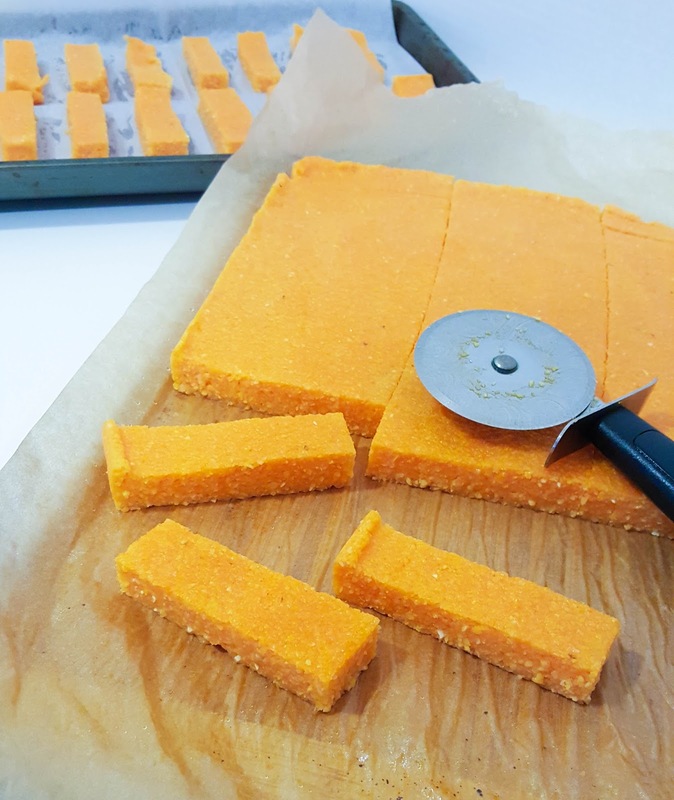 I like to make the parchment sheet larger than the pan so I can easily lift the whole sheet of polenta out of the pan when it's cool, making it easier to cut. Spread polenta in an even layer on the lined baking sheet, smoothing it with a spatula. Place in the refrigerator for a few hours to cool and stiffen up. Once cool, use a pizza cutter, or sharp knife to cut into fingers about 1/2-inch (1.3-cm) wide by 3-inches (7.5-cm) long. 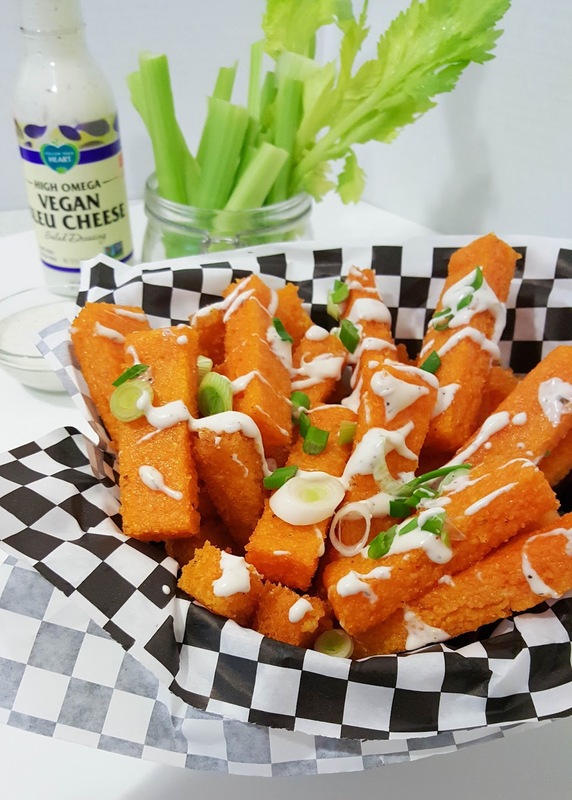 To bake: Preheat oven to 425 F. Arrange fries in a single layer with about 1/2-inch (1.3-cm) in between fries on a baking sheet lined with parchment or a reusable baking mat. Lightly spray with cooking spray. Bake for 20 minutes, flip and bake an additional 20 minutes. Allow to cool for a few minutes before serving. To fry: If you have a deep fat fryer, this is a good time to use it. If not, fill a small deep pot with at least 3-inches (7.5-cm) of oil. The polenta fries need to be fully submerged, and only a few can cook at a time, because they stick to each other like mad. A frying pan doesn't work the best for these because they will stick to the bottom, and the polenta pops quite a lot while frying, so it's best to use a deep vessel. 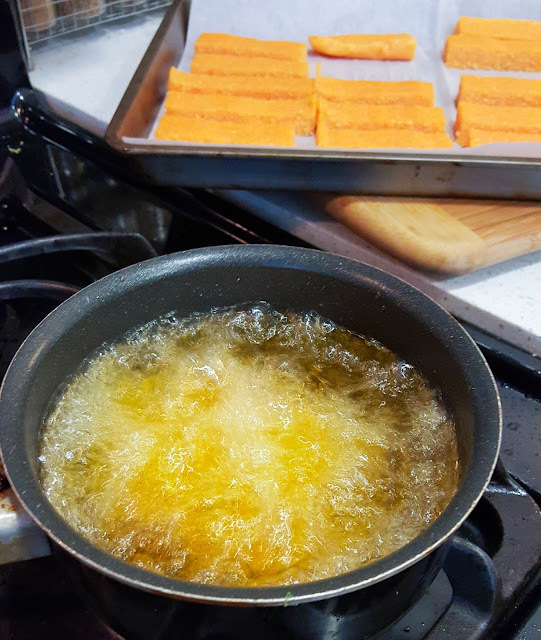 Heat the oil to 350 (you can test the oil by dipping the end of a polenta fry in the oil. If it sizzles, the oil is hot enough. Add just a few to the oil and allow to fry, fully submerged for about 3 minutes. Carefully remove, using tongs, and transfer to a paper towel lined tray to absorb excess oil. These look insanely good! I need a new polenta variation, definitely going to try it.